The January 18th issue of the News of the World newspaper has also republished several bits from the interview; The News of the World’s article can be read below. LIFE on the Rock ‘n’ Roll road isn’t all its crack-ed up to be, according to former Cranberries star Dolores O’Riordan. She believes it can lead to loneliness, heartbreak and drugs. And now Dolores has shocked fans by ditching her rebellious rock-chick image for family life. The Limerick-born singer told Woman’s Way magazine: “The hardest thing before I married was going home, because there was nothing to go home to. That’s when she married Canadian Don Burton and started a family. Now she says all she wants to do is watch her two children grow up. But the former church organist said she NEVER got into drugs in her 13-year career. “Drugs have touched me insofar as I’ve seen how much damage they can do. Dolores has temporarily split from The Cranberries to concentrate on solo projects at her second home in Toronto, Canada. 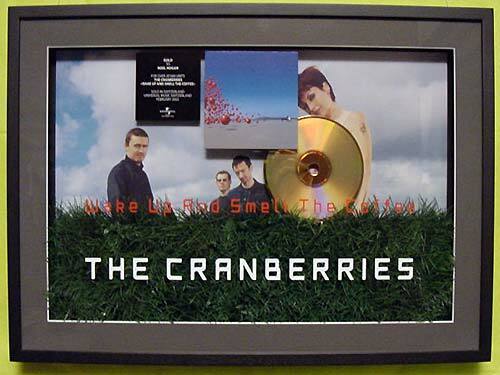 But she insists she’s just as hooked on the music business, as she was when The Cranberries first burst on to the scene in 1990. “We were together for 13 years and we felt it was time for a much needed break,” she explained. Dolores: I Wanna Be a Rockin’ 40-Year-Old Mum! In a short new interview published in yesterday’s (January 22nd) issue of the Irish Daily Star, Dolores confirms that she intends to continue her career long into the future. In the brief article, Dolores relates at how much of an influencer her mother has been in her life, and how much of a lifesaver The Cranberries’ 1996 break was. The article also carries a new photo of Dolores taken at the Leonard Sexton exhibition this past November, although we don’t yet know if it’s the same one that The Star published on November 27th. I’LL BE A ROCKIN 40-YEAR-OLD MUM! Cranberries star Dolores O’Riordan says her ambition is to be back on stage by the age of 40. The mother of two who is living in Toronto with husband Don Burton says she wants to see her children to grow up proud of her — and to see her perform. The star says The Cranberries have temporarily split up as she wants to be a full time mum. “It was getting predictable and lacking in challenge — it’s time to experiment,” said Dolores. She says that has her mum Eileen to thank for keeping her feet firmly on the ground. O’Riordan says she reckons she wouldn’t have survived had she not taken a break in the mid 1990’s. 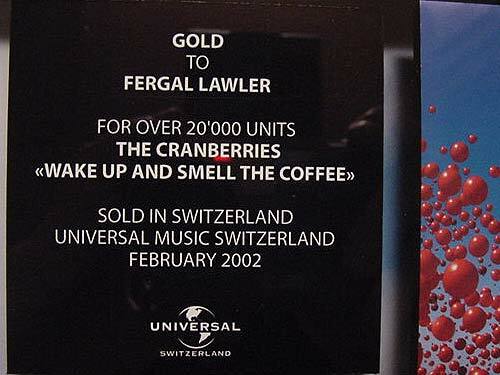 In their January 9th issue, editors of the Australian newspaper “Illawarra Mercury” compiled a list of the best songs of summer from the past 10 years, and The Cranberries’ are at the top of their list for the 1994-1995 season. 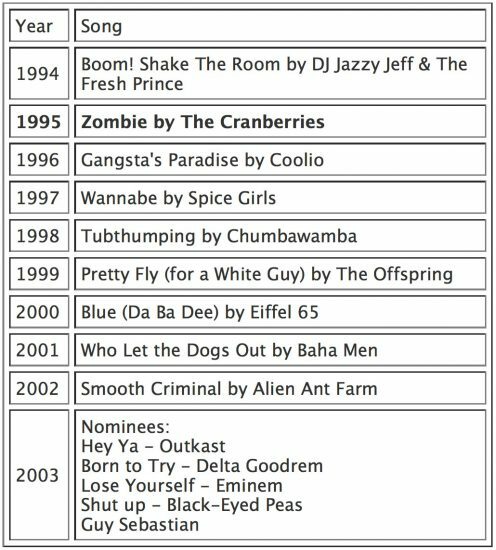 In order to be considered, all songs on the list had to spend time at #1 on the Australian charts. Cede.ch, Sweden’s largest online CD, DVD, and game vendor, is teaming up with Universal Music Sweden to auction a series of gold and platinum award plaques for charity. CeDe manager Eric Bachmann told German newspaper Blick,”Right now we have a minimum bid for each item. 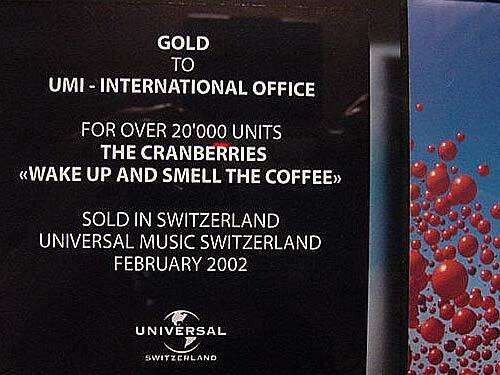 For Sting’s double platinum that includes an original autograph, we’ve set it at 1200 CHF ($960 US)… [there are] seven gold disks from the Cranberries. 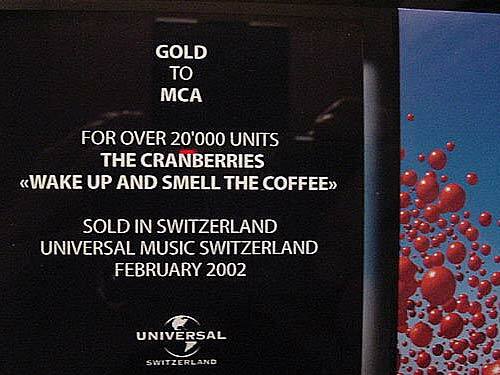 In addition platinum and gold from Sheryl Crow… all between 100 CFH ($80) and 300 CHF ($230).” Other Universal artists in the auction include Zucchero, The Cure, Andrea Bocelli, Texas, Metallica, and Tears for Fears. 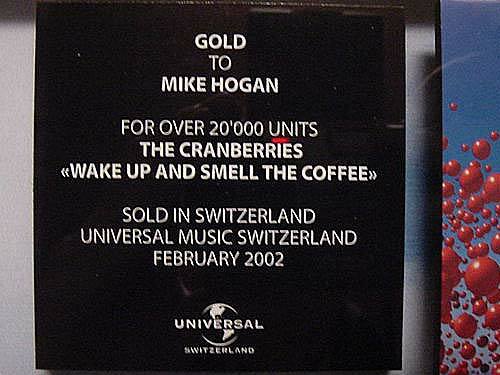 The seven gold awards from The Cranberries are all in recognition of sales of 20,000 in Sweden for “Wake Up and Smell the Coffee.” The seven plaques were presented to MCA, UMI International, Mike Hogan, Noel Hogan, Fergal Lawler, Jay Boberg (MCA President), and Lewis Kovac (former Cranberries manager). Currently, all seven stand at around 300 CHF, or about $230 US. The auctions end on January 22nd and you must be registered to bid. The three charities receiving the proceeds from the auction are Terre des Hommes (Land of the People), Stiftung der Elternvereinigung krebskranker Kinder (Fund for Parents of Children with Cancer), and Susy Utzinger Stiftung für Tierschutz (Susy Utzinger Fund for Animal Protection). Click the golden flash banner on the left side of Cede.ch to access the auction site. As we noted previously, Italian blues man Zucchero is holding a special “fan summit” of sorts this coming Saturday, inviting his O cial Fanclub to meet him in Polesella, Italy to ask questions and, it has now been confirmed, to get a sneak peek at his upcoming duets album. As a precaution against leaks of the recordings, fans are prohibited from taking audio or video recorders to the conference. So although we may not be able to hear it online, we are very likely to have Zucchero fans’ impressions of the duet on Saturday, in addition to more expected news about the duets album. So be sure to check back on Saturday, as we will have news from the fan conference as it happens. Although The Cranberries’ Official Website has been mysteriously inactive for months, a look at the website’s registration record suggests that there has been some movement behind the scenes, as the website was transferred this week to a different hosting company. On January 6, the Official Website was transferred from Irish-based hosting company Elive to Atlanta-based Interland, a company that specializes in small- and medium-sized businesses. Elive was also Zombieguide’s previous hosting company. Elive had hosted the Official Site since it opened in January 1998. 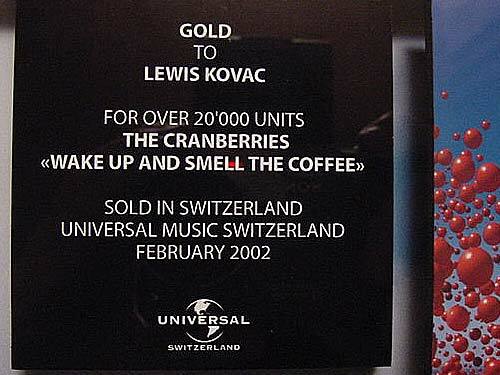 A whois database lookup for the site shows that Alan McEvoy, The Cranberries’ longtime financial consultant, has been designated as the administrative contact after the band parted ways with former manager Lewis Kovac in September. It appears that the bare-bones website for Timeless Music Management is still hosted by Elive and that no changes were made to the registration record. No word on why the band’s administration ended their long-term relationship with Elive. The lack of any updates in the past 4 months caused some to fear the worst for the site’s future. However, the server move suggests that the site will be online at least for the foreseeable future. As to when we’ll see an official update, that’s anyone’s guess. 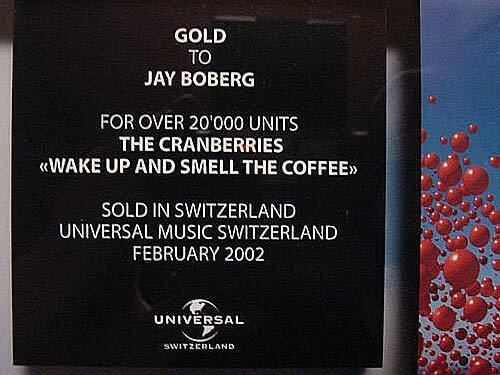 Until then (and even after then), stay tuned to Zombieguide for the latest Cranberries developments, official or otherwise. According to the latest issue of Italian music magazine Sorrisi e Canzoni, Zucchero’s duets album is on schedule for a release in April or May (Given the recent slew of delays, we’ll bet on the latter). Zucchero told an Italian newspaper weeks ago that the tentative title of the album is “Made of Stars.” However, Zucchero has been known to change album titles multiple times before their release, we might expect the same for this one. Though there still isn’t a whole lot of info about the duets album, Zucchero is holding an o cial fanclub meeting in Polesella, Italy, on January 17th, where he will answer fans’ questions, so we can no doubt expect much more information on that date. For more on the progress of Zucchero’s duets album, be sure to check out Un Po’ di Zucchero. On Christmas Day, Britain’s BBC Radio 2 invited Irish celebrity Ronan Keating to host an hour and a half special entitled “Ronan Keating’s Celtic Christmas.” Keating was not only hosted the show, but was given full control over what songs were played on the program. 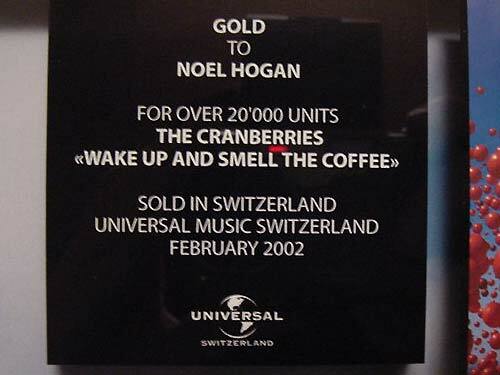 In a move that the BBC website called “surprising,” he chose a Cranberries song for the program, along with selections by fellow countrymen Christy Moore, Clannad, Thin Lizzy, The Pogues, and Jackson Browne. No word on what song he played during the evening Christmas special. Polydor Island Germany has confirmed that the forthcoming Jam & Spoon album “Tripomatic Fairytales 3003” has been delayed until April 5th. Dolores O’Riordan’s collaboration with the group entitiled “Mirror Lover” is the fourth track on the album. You can read the whole interview in English here or in German here. Fairytales 3003″ as we know it.